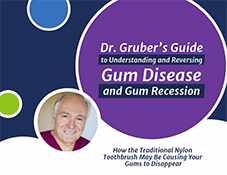 Dr. Jack Gruber DDS provides in-depth answers to listener questions on the PeriClean Radio Show. Topics include: The best time to brush your teeth, the importance of using dental floss and how to make dental care a daily habit. 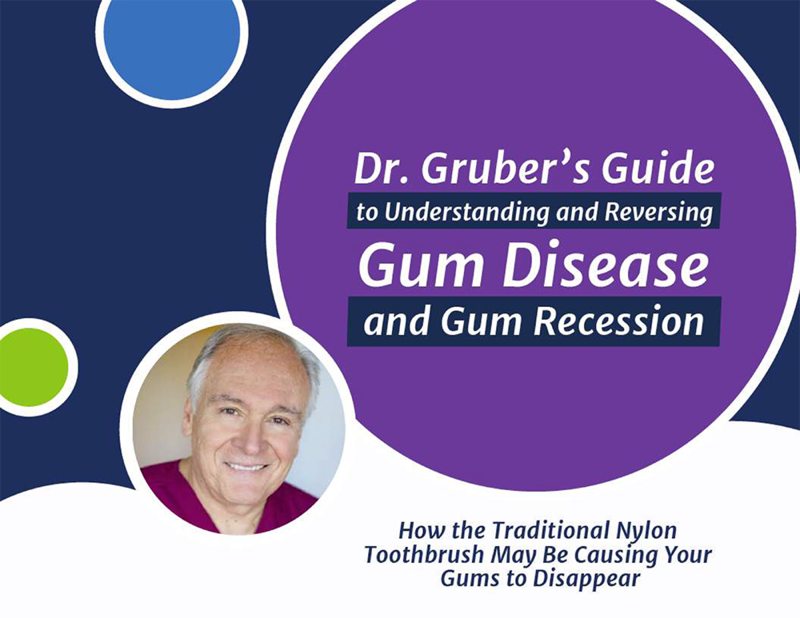 Renowned Periodontist Dr. Jack Gruber DDS takes us on a fascinating journey through the teeth and into the entire body in a way that you have not heard before. Dr. Gruber discusses how the teeth and gums are closely linked to conditions such as: Heart Disease, Vascular Disease, Diabetes and more. Dr. Jack Gruber DDS discusses how to take the very best care of your teeth and gums for optimum oral and total body health. 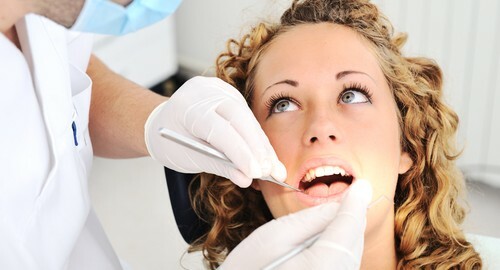 Your dentist or dental hygienist scraped all the plaque buildup between your teeth and buffed and polished each tooth. Your mouth is feeling extra fresh and is cleaner than ever– until you eat your next meal and order that can of soda. Your next checkup and cleaning won’t be for another six months (at most), so how do you maintain that fresh after-dentist-visit feeling? Follow these five easy steps to impress your dentist on your next visit. The American Dental Association recommends brushing at least twice a day, or after every meal. If you can’t get to brushing after lunchtime at the office, the least you can do to help eliminate bacteria from food buildup is to rinse or gargle with water. This gets rid of any food particles that may be lodged between your teeth. Continuously snacking throughout the day in between meals can be harmful to your overall oral health. As the first stop in the digestive system, the saliva in your mouth is in charge of breaking down food and whenever you eat, your mouth produces acid that is harmful to your teeth. So snacking throughout the day means your mouth is continually producing acid that ultimately attacks your teeth. Additionally, be mindful of the foods you snack on as certain treats like gummies or dried fruits that can stick to your teeth. No matter how well you brush, your toothbrush is not designed to reach between teeth where plaque builds up. Plaque, which is as soft as yogurt, can be easily removed with regular flossing. Another advantage to flossing is that it can help detect gum disease. Bleeding gums caused by flossing can be a sign of gum disease, which is best when detected and treated early. Your tongue is a hotbed for bacteria. Remember to clean your tongue regularly to eliminate any bacteria buildup and ultimately prevent plaque buildup. Scraping your tongue of bacteria can also help eliminate bad breath. Standard nylon toothbrushes need to be replaced at least every three months to remain effective. Any longer than that and the bristles become weak while bacteria multiplies. Unlike nylon bristles, PeriClean features rubber bristles that are designed to be gentler on gums and has been shown to support gum regrowth. Created by Jack Gruber, D.D.S, a New York-based periodontist with more than 35 years of professional experience, PeriClean is made with FDA-approved materials and does not collect toothpaste, food particles or bacteria, meaning the toothbrush remains clean and effective for up to six months – three months longer than your typical nylon toothbrush. Flossing is an important step in your oral health routine that should be taught to your children to help keep gingivitis at bay, a serious gum disease that can develop in children who do not have good brushing or flossing habits. As soon as your child has front teeth that are touching (about ages 6-8), they should learn to floss in order to remove plaque and food particles from between teeth where brushes cannot reach. By age 12, all children should be flossing daily, says Jack Gruber, D.D.S, a periodontist with more than 35 years of professional experience and the inventor of PeriClean and PeriKids, ultra-soft toothbrushes that are gentle on gums and have been shown in patients to encourage gum regrowth. 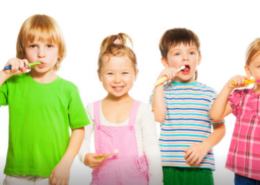 Remember that your children will need your assistance with both brushing and flossing until about age 6-7 — the typical age when they develop the hand-eye coordination needed to brush or floss teeth on their own. Though flossers or floss picks may be easier for you and your child to use initially, regular wax or unwaxed floss can work just as well. If you find shredding occurring while using unwaxed floss, switch to waxed. The best way to teach your child how to floss is to have your child mimic your actions while you floss. To begin, break off two pieces of floss that are about 18 inches long – one for you and one for your child. For reference, 18 inches is about equivalent to the length of your fingertip to your elbow. Show your child how to wind one end of the floss around a middle or forefinger and the remaining floss around the same finger of the other hand. Make sure to teach your child to grip the floss tightly so there is enough tension to create a straight line with the floss. When flossing, emphasize how you curve the floss into a U shape as you get closer to the bottom of your teeth near the gums. Then, rub the side of the tooth as you come back up away from the gum. The best way to instill good dental habits is to set a good example. Allow your children to watch your daily oral health routine, from brushing in the morning to flossing, to motivate them to follow suit. Get your kids excited about taking care of their teeth by allowing them to choose their own toothbrush, toothpaste and floss. Additionally, make flossing fun and educational by examining your child’s teeth together in the mirror and counting the number of teeth they have. 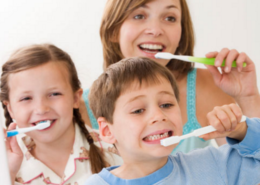 Good oral hygiene habits should be taught as soon as your child understands the concept of cleaning. Remember that flossing cleans 90 percent of bacteria that hides between teeth, and that brushing too hard or over doing it can lead to gum recession. Each New Year brings with it a new beginning, when millions set New Year’s resolutions that guide them to better, healthier lives in the coming year. When reassessing your lifestyle to determine your New Year’s resolutions for 2014, having specific, realistic steps to reach your goal will keep you motivated to achieve them. Here, five easy steps to help you maintain your New Year’s resolution of being healthy by focusing on your oral health, an important factor in your overall health. 1. Check your toothbrush. Your typical nylon bristle toothbrush has a maximum life of four months, so set a reminder for yourself to switch out your old brush for a new one. Another indicator that’ll help you determine whether it’s time for a new toothbrush is to look at the bristles. If the bristles are frayed, toothbrushes are not effective in removing plaque. When selecting a toothbrush, remember one of the main goals of brushing your teeth: removing plaque buildup. Before buying your next toothbrush, review your options, from traditional toothbrushes or electric toothbrushes to PeriClean, a rubber toothbrush that lasts six months and encourages gum re-growth. 2. Reconsider your toothpaste. Though it may seem counterintuitive, extremely abrasive toothpaste is not necessarily the best at removing plaque. In fact, contrary to common knowledge, plaque is as soft as yogurt. Review this list of various toothpastes and their Relative Dentin Abrasivity: An RDA around 100 is best. An RDA lower than 100 may not clean teeth well enough while a higher RDA will be too harsh on thin tooth enamel and your gums—the skin of your teeth. 3. Time yourself. Rather than reciting the alphabet or singing “Happy Birthday” to time how long you brush your teeth, try this more accurate method: brush a section of three teeth while counting to 10. Then move onto the next group of three teeth. This will ensure each tooth gets the about same amount of attention and the session will last at least two minutes. 4. Floss, floss, floss. Did you know that 90 percent of dental problems stem from the accumulation of food and bacteria between teeth that can’t be reached through just brushing? Flossing regularly every day will ensure that bacteria will not build up between your teeth and will therefore not have the chance to attack the gums to cause periodontal disease. 5. Schedule two appointments now. Good dental habits will make visits to the dentist easier. Seeing the dentist every six months for a cleaning and check-up is necessary to remove any hard tartar buildup and to catch any dental issues early on. Only a dental professional should be removing hard tartar from your teeth. Trying to scrape off hard tartar at home can become costly as you may be scraping away irreplaceable enamel as well. As with any medical issue, detecting and treating a dental issue sooner than later will help result in a better outcome while also keeping the cost of treatment down. Simply keeping these five steps in mind is an easy way to maintain part of your overall health. After all, your oral health is linked to heart disease, diabetes and other health concerns. Cheers to staying happy and healthy in 2014! A recent survey conducted by Procter & Gamble and AARP revealed dental health as one of the top three medical concerns among adults 50 and older, and though older adults are making visits to the dentists regularly, not many are maintaining a full oral care routine, including flossing daily, using mouthwash and brushing regularly. 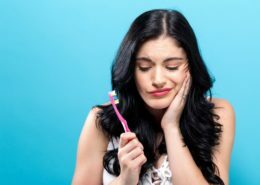 The survey found that a third of adults only brushed once a day, even though the American Dental Association recommends brushing at least twice a day or after every meal to rid of any harmful bacteria that can cause tooth decay and cavities. Remember, your risk of cavities increase with age. When brushing, move the toothbrush back and forth in short strokes, attacking both outer and inside surfaces and reaching for the chewing surfaces of all teeth. If you have difficulty reaching certain places because of limited movement due to arthritis or another condition, try an electric toothbrush. Finally, brush your tongue to remove bacteria and keep your breath fresh. Almost half of the adults surveyed said they did not floss daily. Flossing, according to the ADA, is an essential part of any oral health care routine and should be done at least once a day to remove plaque, which can turn into tartar, from between teeth where a toothbrush cannot reach. Flossing can also help prevent gum disease and cavities. To properly floss, gently slide floss into the space between the gum and tooth, moving the flow away from the gum in an up and down motion. If holding the floss is difficult, try using a wooden plaque remover or a dental pick. Whichever tool you end up using, just be sure to plan a few minutes out of the day to floss. Rinsing with mouthwash, most of which are available without a prescription, can be done before or after brushing to help freshen breath, remove debris, and can reduce gingivitis, plaque and tartar. Though rinsing with mouthwash is not a substitute for brushing or flossing, it can offer additional protection against cavities and gum disease. Consult with your dentist on whether mouthwash should be part of your oral health routine. Your dentist can also advise on whether you should use a mouthwash with fluoride or antimicrobial agents. Sugary foods and drinks, including soda and juice, and hard candies can damage teeth. Avoid empty-calorie foods like candy, cookies and other snacks like chips as they have a high amount of sugar that can stick to your teeth and lead to tooth decay. Instead, consider fruits and vegetables to promote healthy oral hygiene since they help stimulate saliva production, washing away harmful acids and food particles away from your teeth. More than 70 percent of adults surveyed said they visited a dentist for treatment the same or more times than they did 10 years ago, showing concern for their overall oral health. Be sure to maintain regular dental checkups and avoid going to the dentist simply when you are in pain. This is because as we age, the nerves in our teeth become smaller and less sensitive, so by the time you feel pain, it may be too late to save the tooth. Diseases like oral cancer or gum disease are also conditions your dentist can detect in earlier stages. You’re not alone – everyone has bad breath, and you’ve tried everything, from breath mints to chewing gum, yet bad breath still seems to linger. To best treat your bad breath, or halitosis, it’s essential to determine the cause of the problem. The most common cause of bad breath, Jack Gruber, D.D.S. says, is food accumulation and its breakdown by bacteria. The breakdown releases a bad odor, causing that unpleasant smell in your mouth. Not too worry, though. Dr. Gruber says this is easy to control with brushing your teeth and tongue, flossing regularly and using a mild mouthwash. The next common cause of bad breath is dry mouth, which can be a result of mouth breathing or a side effect of certain medications. Dry mouth can cause bad breath since there is no normal saliva flow, which is naturally antibacterial and helps cleanse the mouth of bacteria while washing away food particles. To help keep your saliva flowing, stay hydrated with plenty of water and have some sugar-free mints or gum. Sometimes, though, bad breath is linked to some issue in the lungs or gastrointestinal tract, or some other health problems, such as sinus infections or diabetes can also cause bad breath. If brushing after meals, flossing regularly and rinsing with a mild mouth wash does not solve your problem, your bad breath might be an indicator of gum infection. At this time, it’s advised you see your dentist who will be able to diagnose the deeper cause of your bad breath.